by British Broadcasting Company (BBC), June 7, 2003. BAGHDAD, Iraq (BBC) � Iraq is home to one of the world's oldest civilisations American officials in Iraq have announced that nearly all the Baghdad Museum's priceless antiquities are intact, despite initial fears that they had been lost to looters during the war. US investigators working at the museum slashed the number of antiquities listed as missing from about 170,000 to 3,000 after a secret storage vault was uncovered this week. In another development, the investigators said they had recovered a priceless Assyrian jewellery collection - the Nimrud artefacts - which had been deposited at the Iraqi Central Bank in the early 1990s. The discoveries meant the investigators' work in Iraq was nearly complete, the US administration said. 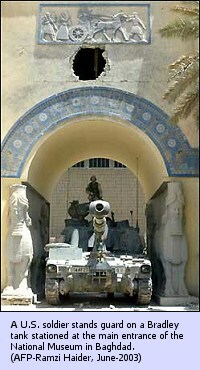 US forces who stormed Baghdad in April were heavily criticised for failing to protect national institutions such as the Baghdad Museum from looters. The Pentagon defended its soldiers' actions, saying they were engaged in combat at the time. Reports that much of the museum's collection of artefacts was missing provoked outrage in the international arts world, but the US administration said on Saturday that few items had actually been stolen. "Earlier this week, 179 boxes that contained the vast majority of the museum's exhibition collection were discovered safe in a secret vault," it said in a statement. "The discovery of these boxes containing nearly 8,000 of the most important items from the museum's collection means that the work of the investigation team is drawing to a close." Other items had been voluntarily returned by museum staff who had taken them for safekeeping at the height of the war. Staff opposed to the US-led invasion had been reluctant, however, to disclose the existence of the secret vault until now. The Nimrud pieces, excavated between 1988 and 1991 from royal tombs beneath an Assyrian palace dating from the Ninth Century BC, were found in a flooded vault of the Central Bank on Thursday after the building's shattered remains were drained. The collection features hundreds of gold and gem-studded items. Despite the US investigators' successes, they had to admit on Saturday that 47 items from the museum's main exhibition were still missing. As for the rest of the collection, British Museum experts are due to advise staff in Baghdad on how best to conserve them. BAGHDAD, Iraq (REUTERS) � A priceless trove of gold jewellery and ornaments from one of the world's earliest civilisations has been recovered from a flooded vault below Baghdad's shattered central bank, officials said yesterday. The famed Treasure of Nimrud, a collection of hundreds of pieces of jewellery from the ancient kingdom of Assyria, was retrieved in the last few days by U.S. investigators and Iraqi officials after the vault was drained. The treasures, discovered between 1988 and 1990 in ancient royal tombs below an Assyrian palace dating from the ninth century BC, had been feared lost when looters plundered Iraq. But U.S. investigators learned the Nimrud artefacts had been placed in a central bank vault in the early 1990s.